A new variational image model is presented for image restoration using a combination of the curvelet shrinkage method and the total variation (TV) functional. In order to suppress the staircasing effect and curvelet-like artifacts, we use the multiscale curvelet shrinkage to compute an initial estimated image, and then we propose a new gradient fidelity term, which is designed to force the gradients of desired image to be close to the curvelet approximation gradients. Then, we introduce the Euler-Lagrange equation and make an investigation on the mathematical properties. To improve the ability of preserving the details of edges and texture, the spatial-varying parameters are adaptively estimated in the iterative process of the gradient descent flow algorithm. Numerical experiments demonstrate that our proposed method has good performance in alleviating both the staircasing effect and curvelet-like artifacts, while preserving fine details. Image denoising is a very important preprocessing in many computer vision tasks. The tools for attracting this problem come from computational harmonic analysis (CHA), variational approaches, and partial differential equations (PDEs) . The major concern in these image denoising models is to preserve important image features, such as edges and texture, while removing noise. In the direction of multi-scale geometrical analysis (MGA), the shrinkage algorithms based on the CHA tools, such as contourlets  and curvelets [3–5], are very important in image denoising because they are simple and have efficient computational complexity and promising properties for singularity analysis. Therefore, the pseudo-Gibbs artifacts caused by the shrinkage methods based on Fourier transform and wavelets attempt to be overcame by the methods based on MGA at least partially. However, there are still some curve-like artifacts in MGA-based shrinkage methods . Algorithms designed by variatinal and PDE models are free from the above lacks of MGA but cost heavy computational burden that is not suitable for time critical application. In addition, the PDE-based algorithms tend to produce a staircasing effect , although they can achieve a good trade-off between noise removal and edge preservation. For instance, the total variation (TV) minimizing  method has some undesirable drawbacks such as the staircasing effect and loss of texture, although it can reduce pseudo-Gibbs oscillations effectively. Similar problem can be found in many other nonlinear diffusion models such as the Perona-Malik model  and the mean curvature motion model . In this paper, we will focus on the hybrid variational denoising method. Specificity, we will emphasis on the improvement on the TV model, and we will propose a novel gradient fidelity term based on the curvelet shrinkage algorithm. where the first term is the image fidelity term, which penalizes the inconsistency between the under-estimated recovery image and the acquired noisy image, while the second term is the regularization term which imposes some priori constraints on the original image and to a great degree determines the quality of the recovery image, and is the regularization parameter which balances trade-off between the image fidelity term and the regularization term . Although the TV model can reduce oscillations and regularize the geometry of level sets without penalizing discontinuities, it possesses some properties which may be undesirable under some circumstances , such as staircasing and loss of texture (see Figures 1(a)–1(c)). (a) The noisy "Lena" image with standard deviation 35; (b) the denoised "Lena" image by the TV algorithm; (c) the denoised "Lena" image by the curvelet hard shrinkage algorithm. Here could be some higher-order norm, for example, . More complex higher-order norms were brought to variational method in order to alleviate the staircasing effect . where is the Gaussian kernel with scale , and the symbol " " denotes the convolution operator. Their studies show that this gradient fidelity term can alleviate the staircasing effect. However, classical Gaussian filtering technique is the uniform smoothing in all direction of images and fine details are easily destroyed with these filters. Hence, the gradient of smoothed image is unreliable near the edges, and the gradient fidelity cannot preserve the gradient and thereby image edges. The third approach is the combination of the variational model and the MGA tools. In , the TV model has been combined with wavelet to reduce the pseudo-Gibbs artifacts resulted from wavelet shrinkage . Nonlinear diffusion has been combined with wavelet shrinkage to improve the rotation invariance . The author in  presented a hybrid denoising methods in which the complex ridgelet shrinkage was combined with total variation minimization . From their reports, the combination of MGA and PDE methods can improve the visual quality of the restored image and provides a good way to take full advantages of both methods. In this paper, we add a new gradient fidelity term to the TV model to some second-order nonlinear diffusion PDEs for avoiding the staircasing effect and curvelet-like artifacts. This new gradient fidelity term provides a good mechanism to combine curvelet shrinkage algorithm and the TV regularization. This paper is organized as follows. In Section 2, we introduce the curvelet transform. In Section 3, we propose a new hybrid model for image smoothing. In this model, we have two main contributions. We propose a new hybrid fidelity term, in which the gradient of multi-scale curvelet shrinkage image is used as a feature fidelity term in order to suppress the staircasing effect and curvelet-like artifacts. Secondly, we propose an adaptive gradient descent flow algorithm, in which the spatial-varying parameters are adaptively estimated to improve the ability of preserving the details of edges and texture of the desired image. In Section 4, we give numerical experiments and analysis. The pipeline of our proposed method is illustrated in Figure 2. There are three core modules in our method. In the first module, we apply the curvelet shrinkage algorithm to obtain a good initial restored image . The second module is the minimizing TV with the new gradient fidelity, and this module is a global optimizing process which is guided by our proposed general objective functional. The third one is the parameters adjustment module, which provides an adaptive process to compute the value for the system's parameters. The rationale behind the proposed method is that high visual quality image restoration scheme is expected to be a blind process to filter out noise, preserve the edge, and alleviate other artifacts. Illustrate the proposed self-optimizing image denoising approach. where denotes the -scalar product of and . The coefficients are called coefficients of function . In this paper, we apply the second-generation curvelet transform, and the digital implementations can be outlined roughly as three steps : apply 2D FFT, product with frequency windows, and apply 2D inverse FFT for each window. The forward and inverse curvelet transforms have the same computational cost of for an data . More details on curvelets and recent applications can be found in recent reviewer papers [3–6, 18, 19]. Figure 3 shows the elements of curvelets in comparison with wavelets. Note that the tensor-product 2D wavelets are not strictly isotropic but have three directions, while curvelets have almost arbitrary directional selectivity. The elements of wavelets (a) and curvelets on various scales, directions and translations in the spatial domain (b). where is the corresponding MGA operator, that is, , for all , and " " is a set of indices. The rational is that the noise is nearly Gaussian. The principles of the shrinkage estimators which estimate the frame coefficients from the observed coefficients have been discussed in different frameworks such as Bayesian and variational regularization [20, 21]. The major problem with wavelet shrinkage methods, as discussed, is that shrinking large coefficients entails an erosion of the spiky image features, while shrinking small coefficients towards zero yields Gibbs-like oscillation in the vicinity of edges and loss of texture. As a new MGA tool, Curvelet shrinkage can suppress this pseudo-Gibbs and preserve the image edge; however, some shapes of curve-like artifacts are generated (see Figure 4). In the cost functional (18), the term is called curvelet shrinkage-based gradient data fidelity term and is designed to force the gradient of to be close to the gradient estimation and to alleviate the staircase effect. And the parameters and control the weights of each term. For the sake of simplicity for description, we always let and in the following sections. where and are parameters in the frequency domain. Proposition 1 tells us that the Euler equation (20) equals to compute a new image whose Fourier frequency spectrum is the interpolation of and . The weight coefficients of and are and , respectively. The energy functional is convex. Then, we can prove the following existence and uniqueness theorem. Using the lower semicontinuity and compactness of and the convexity of , the proof can be made following the same procedure of [23, 24] (for detail, see appendix in ). Here, we actually chose a scale-dependent value for : we have for the first scale (the finest scale) and for the others. where and is the regularized parameter chosen near 0.
for . The parameters are chosen like this: , while the parameters are computed dynamically during the iterative process according to the formulae (33), (36), and (38). In summary, according to the gradient descent flow and the discussion of parameters choice, we now present a sketch of the proposed algorithm (the pipeline is shown in Figure 2). Apply curvelet transform (the FDCT ) to noisy image and obtain the discrete coefficients . Use robust method to estimate an approximation value , and then use the shrinkage operator in (33) to obtain the estimated coefficients . Apply the inverse curvelet transform and obtain the initial restored image . Update the parameter according to (36). Update the parameter according to (38). The essential idea of denoising is to obtain the cartoon part of the image , preserve more details of the edge and texture parts , and filter out the noise part . In classical TV algorithm and Curvelet threshold algorithm, the staircase effects and curve-like artifacts are often generated in the restored cartoon part , respectively. Our model provides a similar ways to force gradient to be close to an approximation. However, our model provides a better mechanism to alleviate the staircase effects and curve-like artifacts. Firstly, the "TVGF" model in  uses the Gaussian filtering to approximation. However, because Gaussian filter is uniform smoothing in all directions of an image, it will smooth the image too much to preserve edges. Consequently, their gradient fidelity term cannot maintain the variation of intensities well. Differing from the TVGF model, our model takes full advantage of curvelet transform. The curvelets allow an almost optimal sparse representation of object with -singularities. For a smooth object with discontinuities along -continuous curves, the best -term approximation by curvelet thresholding obeys , while for the wavelets the decay rate is only . Comparing the above two results, we can understand the difference between two gradient fidelity term smoothing mechanism. We remark that the gradient fidelity term in  will tend to produce more edge blurring effect and remove more texture components with the increasing of the scale parameter of Gaussian kernel, although it helps to alleviate the staircase effect and produces some smoother results. However, our model tends to produce the curvelet shrinkage image and can remain the curve singularities in images; thus it will obtain good edge preserving performance. In addition, another rationale behind our proposed model is that the spatially varying fidelity parameters and are incorporated into our model. In our proposed algorithm, as described in (36), we use the measure ; here is the local power of the residue . In the flat area where (basic cartoon model without textures or fine-scale details), the local power of the residue is almost constant and hence . We get a high-quality denoising process so that the noise, the staircase effect, and the curve-like artifacts are smoothed. In the texture area, since the noise is uncorrelated with the signal, thus the total power of the residue can be approximated as , the sum of local powers of the noncartoon part and the noise, respectively. Therefore, textured regions are characterized by high local power of the residue. Thus, our algorithm will reduce the level of filtering so that it will preserve the detailed structure of such regions. In this section, experimental results are presented to demonstrate the capability of our proposed model. The results are compared with those obtained by using the curvelet shrinkage method , the "TV" model (2) proposed by Rudin et al. , and the "TVGF" model proposed by Zhu and Xia . In the curvelet shrinkage method, denoising is achieved by hard-thresholding of the curvelet coefficients. We select the thresholding at for all but the finest scale where it is set at ; here is the noise level of a coefficient at scale and angle . In our experiments, we actually use a robust estimator to estimate noise level using the following formula: , here, represents the corresponding curvelet coefficients at scale and angle , and MED represents the medium operator to calculate the medium value for a sequence coefficients. Here and are set to be 0.02 and 0.01, respectively. The regularization parameter is dynamically updated to satisfy the noise variance constrains according to (4). where is set to be 0.01, and is the noise variance. 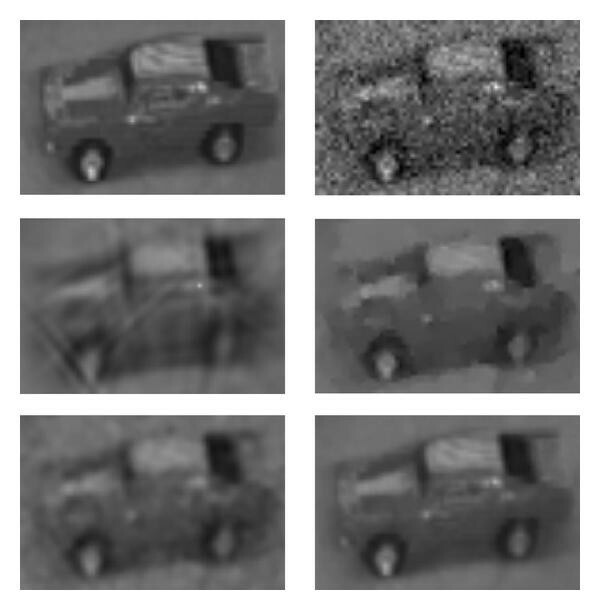 For the following experiments, we compute the quality of restored images by the signal-to-noise ratio (SNR) to compare the performance of different algorithms. Because of the limitation of SNR on capturing the subjective appearance of the results, the mean structure similarity (MSSIM) index as defined in  is used to measure the performance of the different methods. As shown by theoretical and experimental analysis , the MSSIM index intends to measure the perceptual quality of the images. where is the mean of the image ; is the standard deviation of the image ; is the covariance of the image and image ; are the constants. In order to evaluate the performance of alleviation of staircase effect and curve-like artifacts, the difference image between the restored image and the original clean image is used to visually judge image quality. The stopping criterion of both the proposed method, "TV" method, and the "TVGF" method is that the MSSIM reached maximum or the total iteration number reached the maximal iteration number 3000. 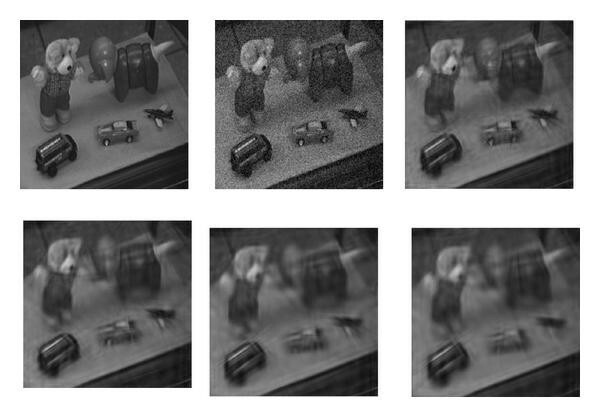 Firstly, we take "Toys" image (see Figure 4(a)) as the test image, and we add Gaussian noise with standard deviation (the noisy image is shown in Figure 4(b)). The SNR value of noisy Toys image is 3.99 dB while the value of MSSIM is 0.30. The results of the curvelet shrinkage, the TV algorithm, the TVGF algorithm, and our proposed algorithm are displayed in Figures 5(a)–5(d), respectively. All the algorithm can improve the value of SNR and MSSIM greatly, the value of SNR obtained by our algorithm reaches 14.37 dB, while those obtained by the TVGF model, the curvelet algorithm and the TV model is just 13.28 dB, 13.33 dB, and 14.21 dB, respectively. Similarly, the improvement of MSSIM obtained by our algorithm is the largest among all the algorithms. From this kind of cartoon image, our proposed algorithm does a good job at restoring faint geometrical structures of the image. 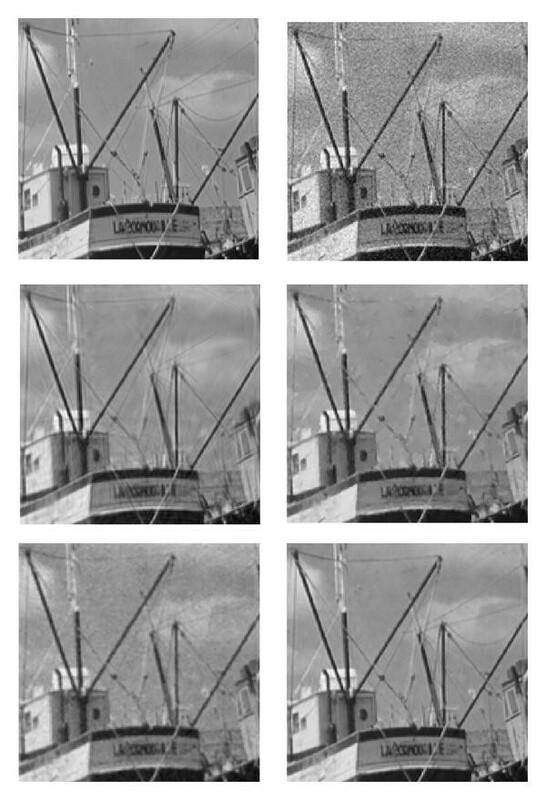 In order to make better judgement on the visual difference of different restored images of different algorithms, we display the subimages which are cropped from Figures 5(a)–5(d). 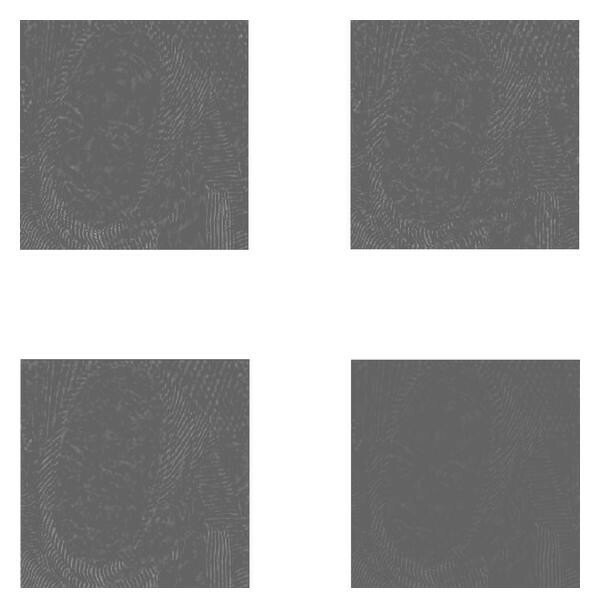 As illustrated in Figures 6(a)–6(f), the restored image by our proposed image (Figure 6(f)) is more nature than any other restored images as shown in Figures 6(c), 6(d), and 6(e). 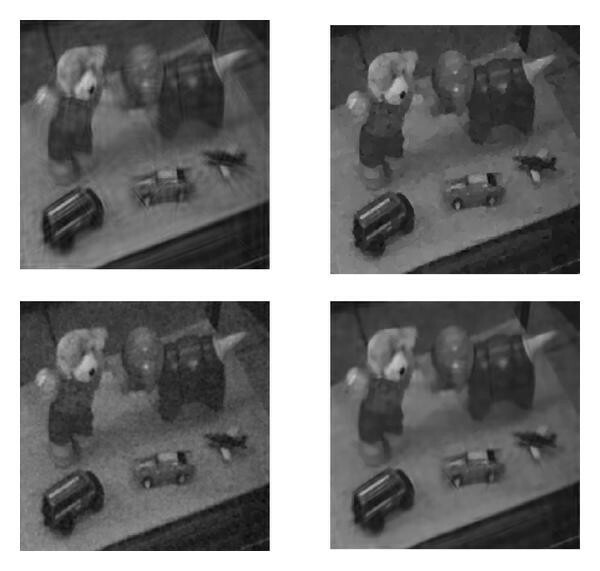 Figure 7 shows the difference image between "Toys" image and restored "Toys" images in Figure 6. From Figure 6, we can see that our algorithm's restored image has less staircase and curve-like distortion comparing with other algorithm's result. The restored "Toys" images (a) by the curvelet shrinkage method (SNR = 13. 33, MSSIM = 0.85); (b) by using the "TV" model (SNR = 14.21, MSSIM = 0.85); (c) by using the "TVGF" model (SNR = 13.28, MSSIM = 0.72); (d) by using our proposed model (SNR = 14.37, MSSIM = 0.88). The subimages of the original, noisy, and restored "Toys" in Figure 5: (a) the original image; (b) the noisy image; (c) the restored image by the curvelet Shrinkage method; (d) the restored image by using the "TV" model; (e) the restored image by using the "TVGF" model; (f) the restored image by using our proposed model. The difference images between the original "Toys" image and restored "Toys" images in Figure 6: (a) by the curvelet Shrinkage method; (b) by using the "TV" model; (c) by using the "TVGF" model; (d) by using our proposed model. In the second experiments, we take "Boat" as the test image. The "Boat" is a kind of image which contains many linear edges and curve singularities. The restored results are depicted in Figure 8, and the difference images are shown in Figure 9. As expected, our hybrid method is less prone to the staircase effect and curve-like artifacts and takes benefits from the curvelet transform for capturing efficiently the geometrical content of image. The original, noisy, and restored "Boat" images: (a) the original image; (b) the noisy image (SNR = 7. 36, MSSIM = 0.43); (c) the restored image by the curvelet Shrinkage method (SNR = 13.51, MSSIM = 0.76); (d) the restored image by using the "TV" model (SNR = 14.36, MSSIM = 0.78); (e) the restored image by using the "TVGF" model (SNR = 13.25, MSSIM = 0.76); (f) the restored image by using our proposed model (SNR = 14.67, MSSIM = 0.79). The difference images between the original "Boat" and restored "Boat" images in Figure 8: (a) by the curvelet Shrinkage method; (b) by using the "TV" model; (c) by using the "TVGF" model; (d) by using our proposed model. In the third experiments, we carry experiments on "Lena" with different noise level and the standard derivation of Gaussian noise is 20, 25, 30, 35, and 40. Figures 10(a)–10(f) display the results for the noisy "Lena" image when the standard deviation of noise is 40. In this case, the value of SNR and MSSIM of the noisy image is 1.54 dB and 0.15, the value of SNR obtained by our algorithm reaches 14.36 dB, while that obtained by the TVGF model, the curvelet algorithm, and the TV model is just 12.01 dB, 13.72 dB and 12.94 dB, respectively. As we know, the "Lena" image is an international standard test image which not only contains the strong vertical and curve edge but also have hair texture. From the result of curvelet shrinkage (Figure 10(c)), the hair texture and the strong vertical and curve edge are restored very good; however some annoying curve-like artifacts are generated. The TV algorithm can preserve the edge, but it lose the hair texture; moreover, the staircase effect is very obvious (Figure 10(d)). 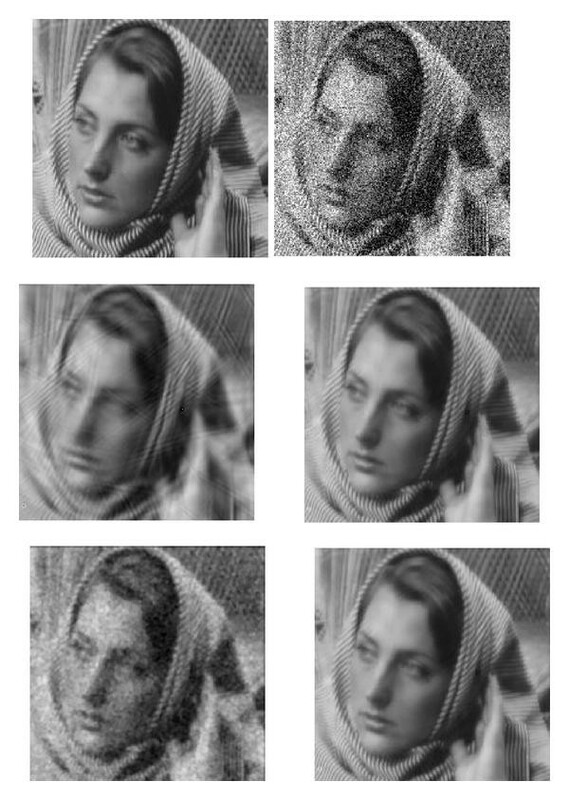 The TVGF algorithm can reduce the staircase effect; however, the edges and textures in "Lena" image look a bit blurred. Compared with the other algorithms, our hybrid algorithm obtains a sharper image with better hair detail, and the restored image is almost free of artifacts. The values of MSSIM of four algorithms also show that our algorithm has the best image perceptual quality. From Table 1, we can find that our algorithm can obtain the largest value of MSSIM. 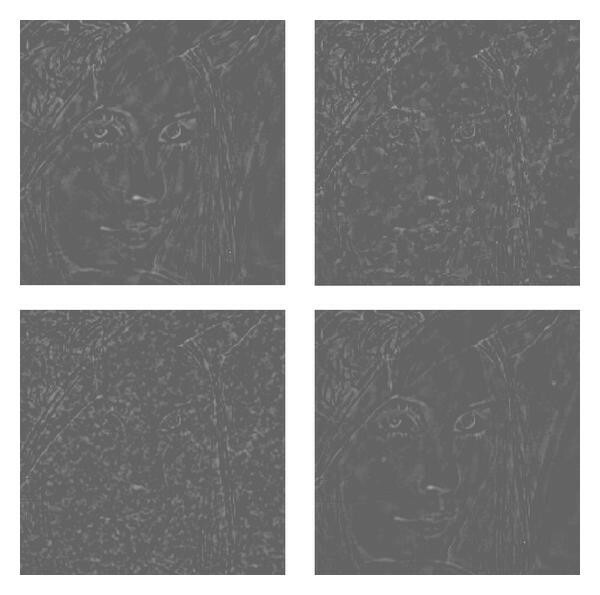 We just display two group results (Figures 10 and 11) for the face part of "Lena" image of various algorithms in the cases of Gaussian noise with standard deviation , respectively. The SNR, MSSIM of the restored "Lena" images by using four models. The numbers in the bracket under the "MSSIM" column refer to the total iteration number of the algorithm. The subimages of the original, noisy, and restored "Lena": (a) the original image; (b) the noisy image (SNR = 1. 54, MSSIM = 0.15); (c) the restored image by the curvelet shrinkage method (SNR = 13.72, MSSIM = 0.79); (d) the restored image by using the "TV" model (SNR = 12.94, MSSIM = 0.71); (e) the restored image by using the "TVGF" model (SNR = 12.01, MSSIM = 0.61); (f) the restored image by using the proposed model (SNR = 14.36, MSSIM = 0.82). 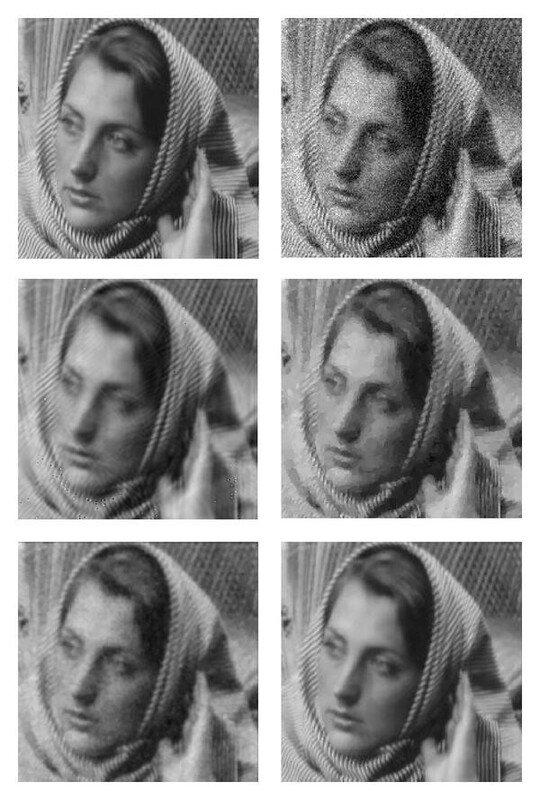 The difference images between the original "Lena" and restored "Lena" images in Figure 10: (a) by the curvelet Shrinkage method; (b) by using the "TV" model; (c) by using the "TVGF" model; (d) by using our proposed model. In the fourth experiments, we take "Barbara" as the test image. The "Barbara" is a kind of image which contains many texture details. The distinguished characteristic of the Barbara image is that it has abundant textures. 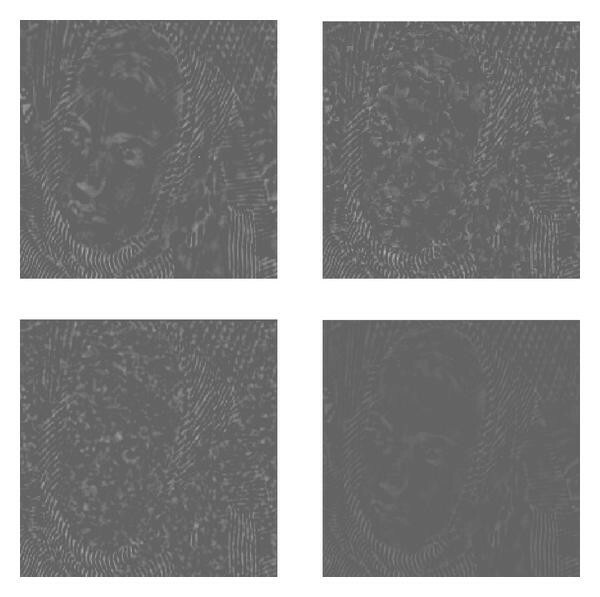 We display two group results (Figures 12, 13, 14, and 15) for the face part of "Barbara" image of various algorithms in the cases of Gaussian noise with standard deviation and , respectively. From these experiments, the visual quality of restored image of our algorithm is better than any other algorithms. Of course, our hybrid algorithm can only restore the regular texture partially, some tiny textures cannot be restored, but the whole image looks more nature and more harmonious. The detail of the original, noisy, and restored "Barbara" images: (a) the original image; (b) the noisy image (SNR = 8. 73, MSSIM = 0.48); (c) the restored image by the curvelet shrinkage method (SNR = 12.05, MSSIM = 0.77); (d) the restored image by using the "TV" model (SNR = 12.74, MSSIM = 0.77); (e) the restored image by using the "TVGF" model (SNR = 11.39, MSSIM = 0.72); (f) the restored image by using our proposed model (SNR = 13.15, MSSIM = 0.81). The difference images between the original "Barbara" and restored "Barbara" images in Figure 12: (a) by the curvelet Shrinkage method; (b) by using the "TV" model; (c) by using the "TVGF" model; (d) by using our proposed model. The subimages of the original, noisy, and restored "Barbara" images: (a) the original image; (b) the noisy image (SNR = 2. 71, MSSIM = 0.26); (c) the restored image by Curvelet Shrinkage method (SNR = 10.45, MSSIM = 0.68); (d) the restored image by using the "TV" model (SNR = 10.12, MSSIM = 0.61); (e) the restored image by using the "TVGF" model (SNR = 9.93, MSSIM = 0.56); (f) the restored image by using our proposed model (SNR = 10.81, MSSIM = 0.70). The difference images between the original "Barbara" and restored "Barbara" images in Figure 14: (a) by the curvelet Shrinkage method; (b) by using the "TV" model; (c) by using the "TVGF" model; (d) by using our proposed model. In addition, we use the SNR and MSSIM index to evaluate the quality of restored images of various algorithms under different noise level. For fair comparison, all the results are the images whose values of MSSIM reach maximum in their iterative process, respectively. 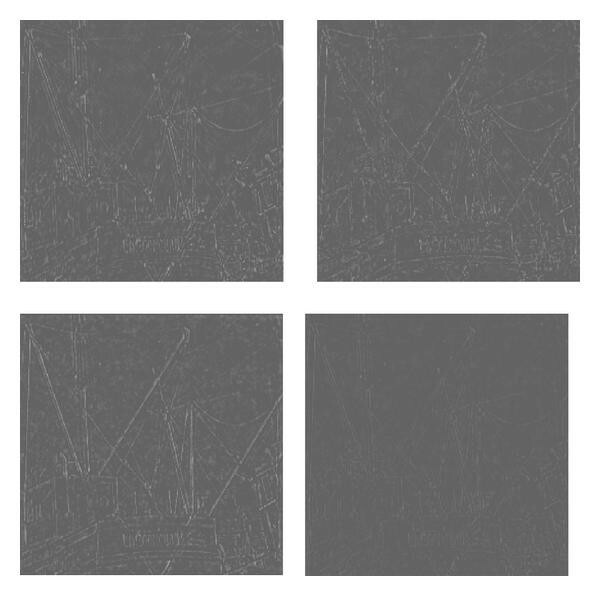 In order to systematically evaluate the performance of the various algorithms from different noise levels, the denoising performance results are tabulated in Tables 1 and 2 for the "Lena" image and the "Barbara" image, respectively. By inspection of these tables, both the SNR improvement and the MSSIM improvement by our model are larger than the other three models. It is interesting to point out that the performance of the TVGF algorithm is not good compared with three other algorithms. This phenomenon has been discussed and analyzed by the research of literature  and the reason is the blurring caused by Gaussian kernel convolution. Of course, the TVGF algorithm actually reduces the staircase effect to some extent. Differing with Gaussian kernel convolution, our proposed algorithm takes advantage of the anisotropic of the curvelets; therefore there is no any edge blurring. The MSSIM improvement shows that our algorithm has better "subjective" or perceptual quality. Especially, the important improvement becomes more salient as noise level increase. Also we can see, both the SNR improvement and the MSSIM improvement obtained by our algorithm become more salient than those obtained by other algorithms for more complex images with more textures, for instance, the Barbara image. Figures 16, 17, 18, and 19 show the amplitude of the MSSIM improvement during the iterative process of the TV model, the TVGF model, and our proposed model. Tables 1 and 2 also list the total iteration number of each algorithm. For example, in Table 1, when the noise standard deviation is 40, the "TV" model needs 3000 iteration steps to reach the maximum MSSIM (0.71), the "TVGF" model needs 1151 iteration steps to reach the maximum MSSIM (0.61), the "TVGF" model needs 1151 iteration steps to reach the maximum MSSIM (0.61), while our model can obtain the good quality restored image with the value of MSSIM being 0.82 using 1033 iteration steps. These experiments show that our algorithm can more quickly reach the best restored image with maximum MSSIM, and our algorithm obtains the best performance comparing with the other algorithms. The SNR, MSSIM of the restored "Barbara" images by using four models. The numbers in the bracket under the "MSSIM" column refer to the total iteration number of the algorithm. 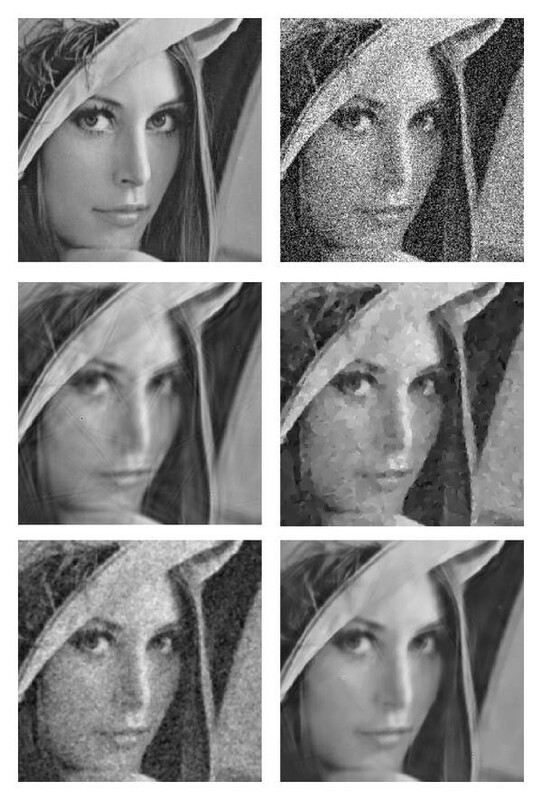 Comparison of the MSSIM results of the different images which is corrupted by some Gaussian noise of standard deviation 20: (a) "Lena"; (b) "Barbara". 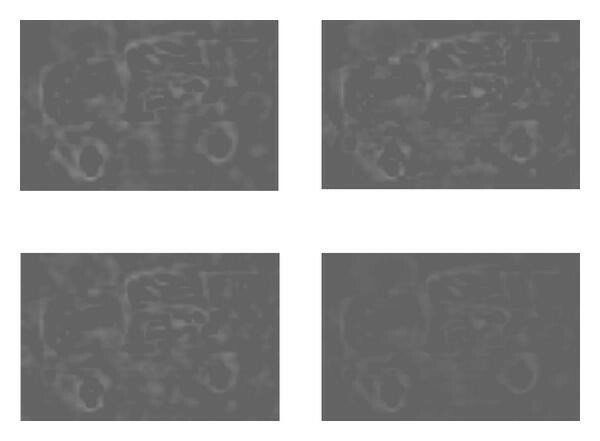 Comparison of the MSSIM results of the different images which is corrupted by some Gaussian noise of standard deviation 25: (a) "Lena"; (b) "Barbara". Comparison of the MSSIM results of the different images which is corrupted by some Gaussian noise of standard deviation 35: (a) "Lena"; (b) "Barbara". Comparison of the MSSIM results of the different images which is corrupted by some Gaussian noise of standard deviation 40: (a) "Lena"; (b) "Barbara". In this paper, a curvelet shrinkage fidelity-based total variation regularization is proposed for discontinuity-preserving denoising. We propose a new gradient fidelity term, which is designed to force the gradients of desired image to be close to the curvelet approximation gradients. To improve the ability of preserving the details of edges and texture, the spatial-varying parameters are adaptively estimated in the iterative process of the gradient descent flow algorithm. We carry out many numerical experiments to compare the performance of various algorithms. The SNR and MSSIM improvements demonstrate that our proposed method has the best performance than the TV algorithm, the curvelet shrinkage, and the TVGF algorithm. Our future work will extend this new gradient fidelity term to other PDE-based methods. The authors would like to express their gratitude to the anonymous referees for making helpful and constructive suggestions. The authors also thank financial support from the National Natural Science Foundation of China (60802039) and the National 863 High Technology Development Project (2007AA12Z142), Specialized Research Fund for the Doctoral Program of Higher Education (20070288050), and NUST Research Funding under Grant no. 2010ZDJH07.